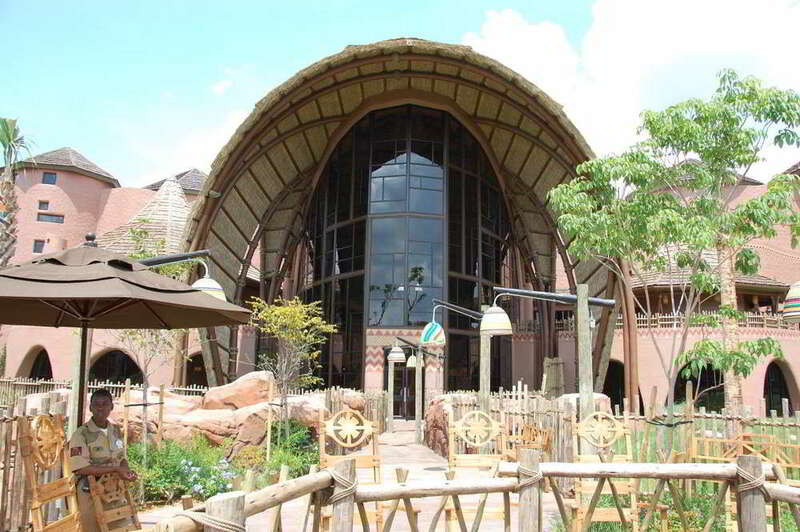 Disney's Animal Kingdom Lodge (AKL) is the first Disney hotel to be completely and consistently themed to a nearby theme park - in this case, Disney's Animal Kingdom park. This is one of Disney World's deluxe resorts so you're sure to find comfortable accommodations, an impressive pool, and great food as well as being a resort where you can have an incredible experience without ever going into a Disney theme park. A highlight of this resort are the cast members from Africa who serve as cultural ambassadors, giving guests a wonderful opportunity to learn about Africa in a very personal way. Disney's Animal Kingdom Lodge - Kidani Village lobby and savanna - a beautiful Disney World Deluxe resort. Disney visited numerous African countries and over 20 African lodges in their quest to create a culturally relevant resort that celebrated the people, wildlife, art, and cultures of the vast African continent. The resort is beautiful and brilliantly themed to resemble a South African Wildlife reserve but also takes inspiration from African kraals, which are compounds with huts and stockades that surround livestock. The resort incorporates different building styles, colors and materials found throughout Africa including things like thatched roofs and mud fireplaces. Disney's Animal Kingdom Lodge is a deluxe resort at Disney World that features several savanna areas that are home to African animals like giraffs, zebras, and bongos. 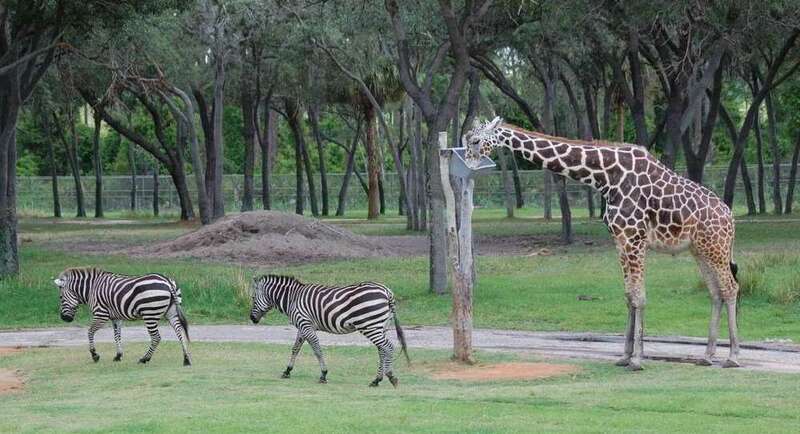 In many ways, the resorts four savanna areas (Arusha Rock, Uzima, Pembe and Sunset Savannas) take a starring roll with more than 200 African animals, encompassing over 30 species, on display both day and night. At how many resorts can you look out from your balcony and see giraffes or zebras? The resort's landscaping emulates different types of African terrain: forested areas, river systems, grasslands and the bush. A Disney World vacation can be really busy but Disney's Animal Kingdom lodge provides lots of wonderful spaces to sit and relax and enjoy the African animals that make their home at this beautiful deluxe resort. Disney's Animal Kingdom Lodge has rooms with balconies that overlook the pool or the savanna areas with African animals. The least expensive rooms are "standard view" rooms that overlook the rooftops and parking areas. Equally impressive is the extensive collection of African art throughout the resort - there are more than 380 museum quality pieces on display in the hotel's public areas and over 4000 handcrafted works spread out through the guest rooms; in fact, Disney has the largest collection of museum quality pieces found anywhere outside of Africa. The Animal Kingdom Lodge resort has two main areas. Jambo House is the original portion of the resort and has the largest lobby area; it is also where you'll find standard hotel rooms as well as Disney Vacation Club (DVC - timeshare program) studio and condo type units. The Kidani Village building was opened in 2009 as part of Disney Vacation Club and features studio units with kitchenettes, as well as multi-room villas. Reservations in this area are not limited to DVC members; the general public can reserve accommodations in either building, subject to availability. You do receive daily maid / housekeeping service when you reserve accommodations in the Disney Animal Kingdom Lodge Villa (DVC) areas. Because this resort is so new and modern, both the Jambo House and the Kidani Village areas have beautiful pool areas. The Kidani pool deck has more to offer with an extensive wet play area tailored to different ages. Jambo House doesn't have the wet-play area but its zero-depth pool is larger. Disney's Animal Kingdom Lodge features a beautifully landscaped, zero-depth entry pool with slide and a smaller wading pool for little ones. Advantages - The animals, art and cultural representatives from Africa make this a very unique and special resort. The standard (non-view) rooms are often some of the lowest priced rooms of any Disney deluxe resort; though I do recommend upgrading to a pool or savannah view, if you can afford it. The resort has very nice pools - in fact, the pool area in the Kidani Village section is probably the best pool for young children anywhere on Disney property. The fact that this isn't in a "multi-resort area" and is a bit off the beaten path means that you have less non-resort guests just wandering through the lobby. A stay here is both relaxing and exciting. Disney's Animal Kingdom Lodge - Kidani Village has a smaller pool than Jambo house but has an extensive wet play area for kids with three different zones geared towards different ages. Disadvantages - Disney's Animal Kingdom Lodge is the only deluxe resort that offers only bus transportation to the Disney World theme parks. You are closest to the Animal Kingdom theme park but this deluxe resort is the farthest Disney hotel from the Magic Kingdom. This is a "stand-alone" resort, meaning that it isn't in a cluster of resorts; while this definitely makes the public areas less congested by non-resort guests, it also limits your nearby dining options. There are three sit-down restaurants and a food court on AKL property. Note: For the safety on the animals, no balloons are allowed at Disney's Animal Kingdom Lodge - something you'll want to remember before purchasing any balloons in the Disney theme parks. Jambo House's Uzima Pool has a 67-foot water slide and is a large zero entry pool covering 11,000 square feet and filled with 234,980 gallons of water. It also has a small wading pool for the kids and a secluded and landscaped whirlpool spa area. Kidani Village's Samawati Springs pool area features a 4700-square foot, zero-depth entry pool with a 128-foot slide. The Uvanja Camp water playground has 3 zones for children of all ages. The Observation Station is for children age 4 and younger with climbing areas, cargo crate tunnels, a geyser and shallow wading pool. The Departure Zone is for ages 5 - 7 and features a leaky tower and spraying flowers. The Base Camp is designed with kids age 8 and older in mind with a slide, waterfall wet play area, and water cannons. Four (4) Savanna areas with African wildlife viewing areas. Staff includes goodwill ambassadors from African countries, available to answer questions. Fire pits with nightly storytelling experience. Daily fun activities for children, including things like rhythm instrument times and chalk rubbings of the resort's medallion. Adult activities like Wine Tastings (extra cost) and Free Resort Tours (Culinary Tour, the Sanaa Cultural Tour, and the African Inspired, Disney Designed tour). Most rooms have 2 queen-size beds. Rooms with queen bed + bunk beds are a nice option for families with a boy and girl. Villas and Studio units have microwave ovens; available on request for regular hotel rooms. 1-to-3 Bedroom Villas have full kitchens. Free bus transportation to the Disney Theme Parks, Disney Water Parks, and Disney Springs (formerly Downtown Disney). Some rooms have an in-room Jacuzzi. Uzima Springs Poolside Bar at Disney's Animal Kingdom Lodge. Jiko - the cooking place: A signature dining location at Disney's Animal Kingdom Lodge. Mara - Food court area open for breakfast, lunch, and dinner. Victoria Falls Lounge - a mezzanine lounge overlooking the Boma restaurant. Jiko - Inspired by "The Lion King", Jiko means "The Cooking Place" and has two wood-burning ovens. The restaurant offers delicious African, Indian and Mediterranean cuisine. Specialty dining offering dinner only. This location takes two Disney Dining Plan table service credits per person. Sanaa - wonderful new sit-down restaurant in the Kidani Village (DVC) area. Request a table near the windows and you'll be able to see the animals in the savanna. Wanyama Safari and Dinner is an exclusive experience only available to guests of Disney's Animal Kingdom Lodge and includes a 90-minute tour is limited to just 12 people per day and includes an up-close look at African animals as well as a delicious meal at Jiko. Advance reservations required - Cost: Over $60 per guest / Disney Dining plans not accepted for this experience. Jambo House's Zawadi Marketplace is one of most unique gift shops at Disney World. Zawadi Marketplace (Jambo House) - This might be Disney World's most unique gift shop with authentic African crafts, wood carvings, Zulu baskets, handpainted dishes, handmade jewelry as well as Disney's Animal Kingdom lodge logo items. Johari Treasures (Kidani Village) - This shop has gift items, resort logo items, a small selection of sundry and grocery items, as well as a beverage station for use with the resort refillable mugs. Most standard hotel-type rooms have 2 queen beds and are 344 square feet. Some king-bedded rooms available. The king bed rooms also have a day bed. All of the rooms have balconies. Standard View overlooks the parking lot and rooftops. These are some of the least expensive rooms at a Disneyworld deluxe resort. Pool View - Overlooks the pool area. Pool View / Bunk Bed - Overlooks the pool area. These rooms have 1 queen beds and a bunk bed. Pool View / Deluxe Room - Overlooks the pool area. These rooms have three configurations: 1 queen bed and a bunk bed; 2 queen beds; - or - a king bed and daybed. 381 square feet. Savanna View - These rooms overlook one the Wildlife viewing / Savannah areas. Arusha Savanna View - These rooms guarantee a view of the resort's Arusha Savannah, which is the most central savannah. Savannah View / Bunk Bed - Overlooks one of the Savannah Wildlife viewing areas. These rooms have 1 queen bed and bunk beds. Arusha Savannah View / Bunk Bed - Overlooks the Arusha Savannah and has 1 queen bed and bunk beds. Savannah View / Deluxe Room - Overlook the Savannah areas. These rooms have three configurations: 1 queen beds and a bunk bed; 2 queen beds; - or - a king bed and daybed. 381 square feet. Club Level / Pool View or Savannah View - These rooms are the size of the deluxe rooms but offer extra amenities. Kilimanjaro Club level guests receive personalized front desk and Concierge service, evening turn down service with chocolates, secure key access to the Club Level Lounge serving light refreshments from 7:00AM to 10:00PM daily; complimentary Health Club access, and complimentary fax assistance. Club Level / 1 Bedroom Suite - Pool View or Savannah View - These rooms have one bedroom with 2 queen sized beds; the parlor area also has a queen sized sofa sleeper - this suite can sleep six. Kilimanjaro Club level guests receive personalized front desk and Concierge service, evening turn down service with chocolates, secure key access to the Club Level Lounge which serves light refreshments from 7:00AM to 10:00PM daily; complimentary Health Club access, and complimentary fax assistance. Club Level / 2 Bedroom Suite - Savannah View - These rooms have two bedrooms - the first bedroom has a king bed; the second bedroom has 2 queen sized beds; and the parlor area also has a queen sized sofa sleeper - this suite can sleep eight (8) people. Kilimanjaro Club level guests receive personalized front desk and Concierge service, evening turndown service with chocolates, secure key access to the Club Level Lounge which serves light refreshments from 7:00AM to 10:00PM daily; complimentary Health Club access, and complimentary fax assisatance. Kidani Village Entrance. The lit lanterns indicate you are welcome to come in. Standard View overlooks the parking lot, resort, or pool. Savannah View overlooks one of the three wildlife viewing areas. Jambo House - Studio unit - Standard View or Savannah View. These rooms have a queen bed and a double size sleeper sofa. The kitchenette has a mini-refrigerator, a microwave, coffee maker, and table & chairs. Sleeps 4. Jambo House - 1 Bedroom Unit - Standard View or Savannah View. These rooms have a master bedroom with a king bed and whirlpool tub. The living room has a queen size sleeper sofa and a single-size sleeper chair. The unit has a fully equipped kitchen and washer and dryer. Sleeps 5. There are some units that only sleep 4. Kidani Village - Studio unit - Standard View or Savannah View. These rooms have a queen bed and a double size sleeper sofa. The kitchenette has a mini-refrigerator, a microwave, coffee maker, and table & chairs. Sleeps 4. Kidani Village - 1 Bedroom Unit - Standard View or Savannah View. These rooms have a master bedroom with a king bed and whirlpool tub. The living room has a queen size sleeper sofa and a single-size sleeper chair. The unit has a fully equipped kitchen and washer and dryer. Sleeps 5. Kidani Village - 2 Bedroom Unit - Savannah View. These rooms have a master bedroom with a king bed and whirlpool tub. The second bedroom has 2 queen beds and a bath. The living room has a queen size sleeper sofa and a single-size sleeper chair. The unit has a fully equipped kitchen and washer and dryer. Sleeps 9. Disney's Animal Kingdom Lodge Resort includes rooms available to Guests with disabilities, including wheelchair-accessible bathrooms and rooms designed for the hearing impaired. Disney's Animal Kingdom Lodge - Kidani Village Bus Stop. Complimentary transportation is provided to the Disney World theme parks and water parks. Guests may use Disney's Magical Express - a shuttle bus service included in your reservation - between the Orlando International Airport and Disney's Animal Kingdom Lodge. Disney buses are available to take Animal Kingdom Lodge guests to the Walt Disney World theme parks, water parks, and Downtown Disney. Disney's Animal Kingdom Lodge Resort is where we go to hang out when we have spare time because we love this hotel! The resort's details are nothing short of amazing, the animal viewing areas are a treat and you definitely get a deluxe resort experience at this wonderful and unique hotel. Animal Kingdom Lodge is sophisticated enough to appeal to honeymooners and guests traveling without children while the pools and on-site amenities also make it a perfect location for families. We've had so many wonderful cross-cultural experiences and conversations with the cast members here. While it hasn't been as popular as the Magic Kingdom area hotels on the monorail loop, this hotel really is some of Disney's finest work with so much to offer in the way of a unique and memorable vacation experience.